Posts Your First Hate Mail: My First Guest Post of 2011. Woo hoo! 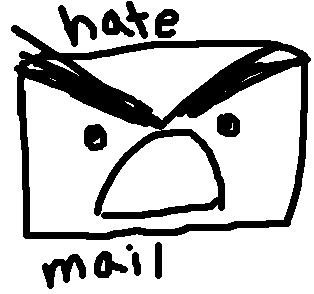 Your First Hate Mail: My First Guest Post of 2011. Woo hoo! “Your First Hate Mail: How Life Can Change After Working For a Magazine” has gone live at The Fictorian Era. Go! Read it! Support them! But first, let me tell you about our little literary meet-cute. So I was at World Fantasy Con in October. Besides geeking out over some of my favorite authors, I was also scouring the joint for Sean Markey. Now I have never met Sean, but we’ve tweeted back and forth and I was hoping to track him and his wife down for some conversation. Mercedes was on the hunt. On the prowl. Beware. So Matt gave me a dollar. I gave him a hug or promised him my soul or some such thing, and Bill and Peggy Wu from William Wu Books gave me their copy of The Last Unicorn. I was feeling the love. And that is the story of how I began stalking Peter S. Beagle, Matt, Bill and Peggy, but no longer Sean Markey. Er, I mean, that’s the story of how this guest post came to be. I’m outside of your window with my binoculars right now, Anthony! Ah! You know too much. Am happy to have such an awesome stalker. FYI, it was the heels that gave you away. Maybe try a quieter shoe next time? Perhaps some Vibram Five Fingers? Waaaay too much. Nobody wants to see your Smurf boxers, Tony. Y’know, Sean, I had a pair of Vibrams. They’re just not made for me because my second toe is slightly longer than my first. You would have heard me yowling and cursing and hopping from 50 feet away. Thanks, Jamal! I know of your not-so-secret love for The Last Unicorn. The graphic novel is absolutely gorgeous! It was so awesome meeting you, Strider! I think everybodyshould get hate-mail tattoos. We could all do them ourselves at the next con. It’s a terrible, terrible idea. Let’s do it!